Fermented Tofu (酱豆腐, 腐乳, jiang dou fu, fu ru) is also known as fermented bean curd or preserved tofu. It is a salty condiment in Chinese cuisine. There are many types of fermented tofu. The most common ones are white fermented tofu (白腐乳) and red fermented tofu (红腐乳) for cooking. Fermented tofu has a soft and spreadable texture, and a salty and savory taste resembling that of certain cheeses. Similar to cheese, fermented tofu is made when several molds are intentionally introduced to tofu and are allowed to grow for a few days. Then, salt and seasonings, such as cinnamon, star anise, chili, ginger, and Chinese liquor (白酒), are added to the tofu. This may marinate for a week, or up to a year, until the tofu has hardened in texture and been infused with a very deep savory flavor. Fermented tofu is usually likened to cheese, in that it has a stinky smell but tastes great. To sample the flavor of fermented tofu, spread a small amount (1/2 teaspoon) on steamed bun and eat them together. Fermented tofu can be used in various cooking methods and can also be used as an ingredient in a dipping sauce. It is an important ingredient in Chinese red cooking, where it is used with other spices to make a braising sauce. For an example of red cooking, see my braised pork spare ribs. It is also used in steamed and stir fried dishes. Fermented tofu can be directly served with congee, steamed buns, and noodles, thus acting as an alternative to salted vegetables or pickles (咸菜, xian cai). It is also used in a dipping sauce for Chinese hot pot. 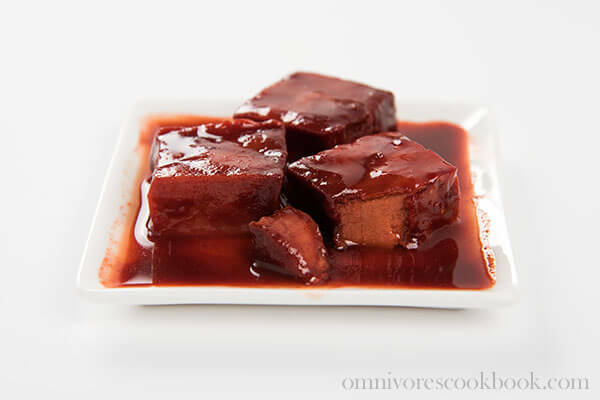 Be aware that red and white fermented tofu have very different flavors and cannot be used interchangeably in cooking. For Chinese red cooking and most other cooking, the red kind is used. Both red and white can be used in dipping sauces. 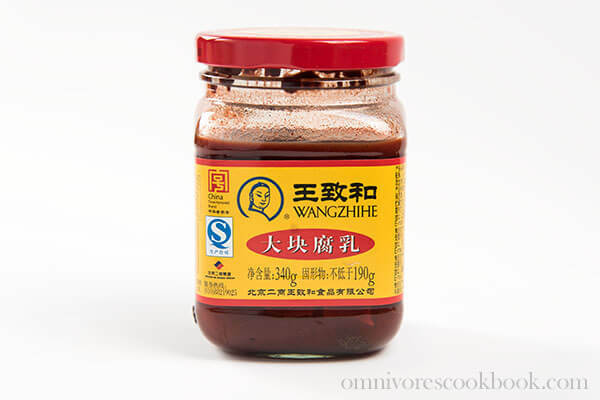 For red fermented tofu (used in dipping sauces and braised dishes), Wang Zhi He is a very famous brand in China, and you can on Amazon, too. Or you could always check out a nearby Chinese market. Once opened, fermented tofu can be stored in an air-tight jar in the fridge for up to 6 months.